LIC Jeevan Tarun (Plan 834) – All details with premium and benefit examples. 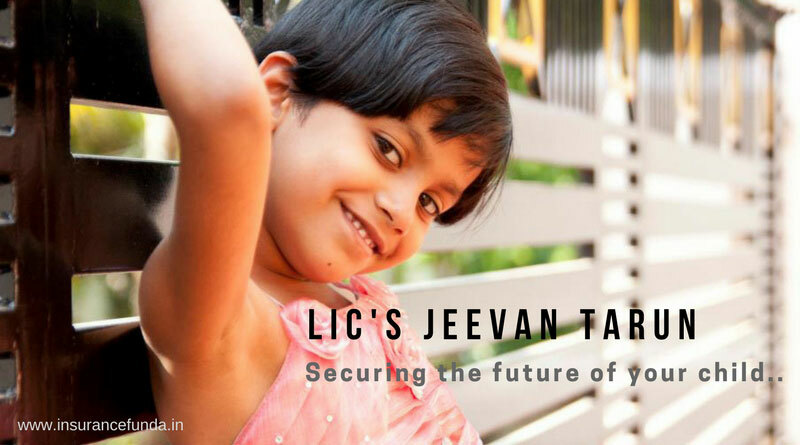 Jeevan Tarun is one of the most popular children’s plan from the public sector insurance major LIC of India. The plan is intended to help parents to meet Educational and marriage expenses of their Children. Educational plans are becoming more and more relevant in the current scenario where educational expenses are soaring high day by day. Jeevan Tarun is designed in such a way that money back at the desired rate can be obtained from 20 th age to 25 th age of the child. Unlike other money back plans from LIC, the rate of money back obtained can be selected by the customer in this plan. No need to add that this facility offers some degree of flexibility to the plan. Plan to meet Educational and Marriage expenses of children having age between 90 days and 12 years of age. Money back available from 20 th to 24 th years of age of the children. Tax rebate under section 80 C of Income Tax act can be availed on the Premium paid. Premium Waiver Benefit (PWB) rider is available as an additional option for Jeevan Tarun. Jeevan Tarun Calculator – It is a complete online solution to understand the premium, Insurance coverage and benefit details of Jeevan Tarun policy. You can customise the plan illustration based on the age of the child and the premium you can afford. LIC Jeevan Tarun (834) – Survival Benefit options. Sample Illustration of Jeevan Tarun – Children’s plan from LIC. Let us consider the example to understand the benefits for Jeevan Tarun Plan. Details considered for the illustration are given below. On completion of the premium paying term which is 20 years in our case, survival benefit at the rate of 15 % of Sum Assured (Rs. 1,50,000) will be available for 5 years. As the policy holder attains 25 years of age the policy matures and the balance of Sum Assured along with Bonus* and Final Addition Bonus* available will be available. You can understand the full details of LIC Jeevan Tarun from the benefit illustration given below.